After reading Genna’s story, I decided that she may have been the most demanding dog of all four sheepies. She’s my personal favorite, too. This afternoon, I added a third layer of fringe on her head to make her ‘hairstyle’ look even bigger. Can you see the difference?? I love it because her hair moves the most. I used a combination of matte opaque aurora borealis seed beads and opaque clear seed beads. 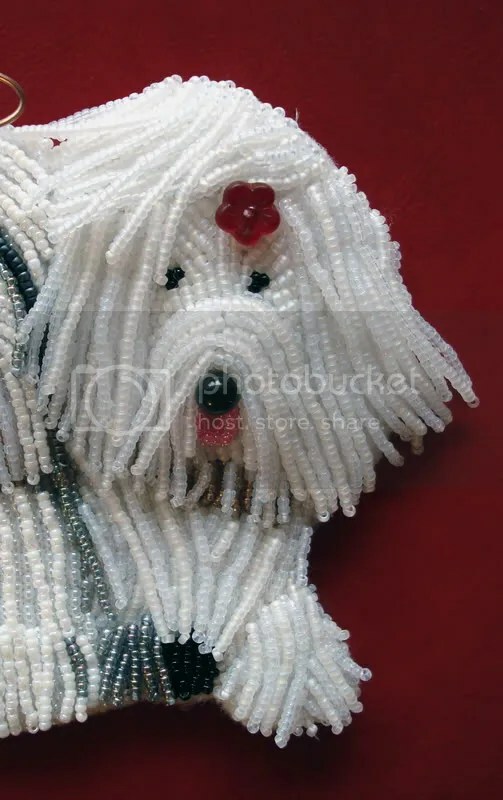 All of the beads used on this piece are Japanese size 15’s, which are very small. I prefer this size because they allow me to add a great amount of detail in a small amount of space. I believe that I am finally finished with the beaded portion of this piece. The above photo shows all four of The Divas together. (Click to enlarge Bailey, Rachel, Eliza, & Genna.) Below is the photo that I’ve been working from. Next, I’ll begin mounting the beadwork to a canvas. I do have a vision of how I would like the finished piece to look. The difficult part will be how to achieve it…. 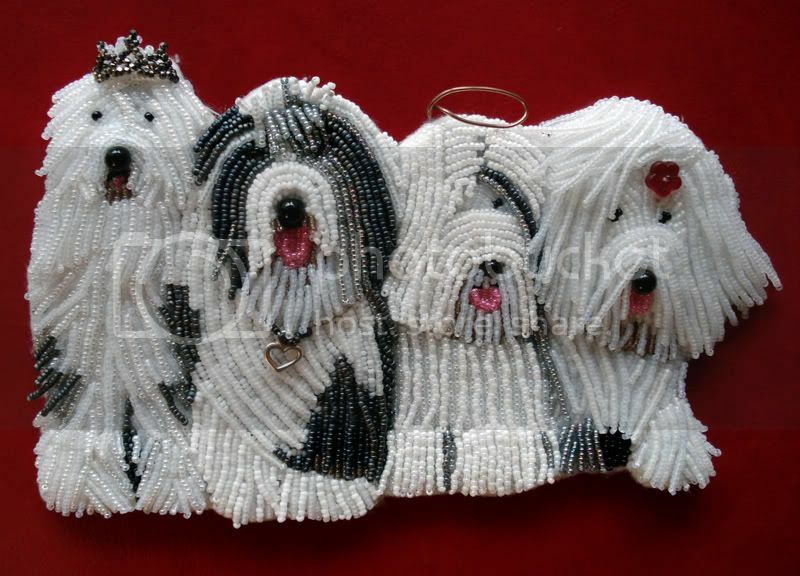 >Oh I meant the furry ones, not the beaded ones, though they are incredible in their own right, I just want those dogs! 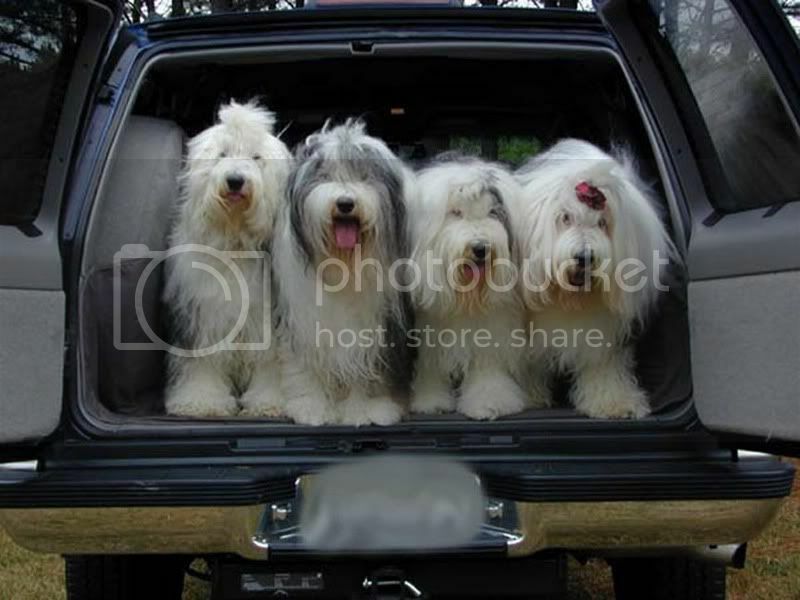 >The dogs are gorgeous, I want them and all four of them! >No way!I taught the end-piece will be similar to the orignals.But…it’s the bead-carbon-copy of the original picture.Amazing. >I LOVE IT. I can’t tell you how much i love what you’re doing/what you’ve done! >To say I’m awed, impressed, and simply blown away doesn’t convey how much I love how The Divas came out. Congratulations! >Oh my, they look amazing! Genna was quite the lady, wasn’t she? :)Thank you for sharing your work like this. It is so much fun to watch your pieces unfold through your pictures and descriptions. Can’t wait to see what you do with the canvas and background work. >They look so real!!! Compliments!!! >All I have to say is “WOW”! How long did it take you total? I looked back though your blog at all the progress you did on these dogs it is very interesting! I love it that you posted the real photo of them too!I just love this piece it is really really great.